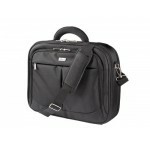 Modern and deluxe storage and carry bag for 16" notebook and peripherals. Scaleable main compartment to fit most notebooks with screens up to 16" (385 x 266 x 44 mm). 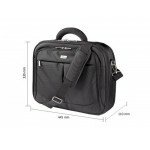 High-quality finishing with durable fabric and metal fittings and zipper-pulls. 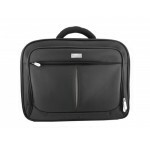 Padded interior to protect your notebook. 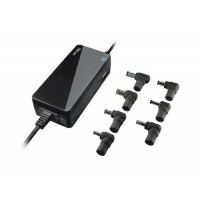 Extra compartments to store your iPod, MP3 player, PDA, power supply, etc.. High strength fabric for heavy duty use. Dual metal zippers and velcro fasteners. 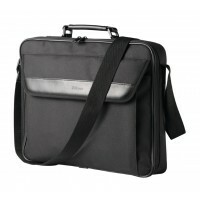 Durable and adjustable shoulder strap with metal fittings and shoulder pad. With back strap to attach the bag to a trolley bag.